May be the most luxurious 3 bedroom Villa in Pissouri Bay. Stunning newly built detached offering comfort and relaxation with Private Swimming Pool & landscaped gardens, ideally situated, just 200 metres from the beach of beautiful Pissouri Bay, shops, tavernas. The villa is decorated to an extremely high standard throughout with modern furnishings the villa has been specifically designed to cater for luxury villa holidays. The spacious ground floor consist of an open plan dining and lounge area with dark brown leather suite (one 3 seater sette and two 2 seater settees) Dining/kitchen area a dinning table with seating for 6 persons, 32’’ Widescreen LCD TV, with Sky Satellite Free to Air package, a home cinema ( DVD) and CD player. The modern kitchen is fully equipped with dishwasher, electric ceramic hob unit with canopy hood extractor fan above, electric oven/grill, microwave, fridge/freezer, toaster, kettle,. To the rear of the kitchen there is a separate utility room which houses the washing machine, a filter coffee machine. There is also a downstairs cloakroom. Patio doors from both the lounge and dining area lead to terraces and the enclosed garden and pool area. The ground floor veranda is the place to spend a quiet evening with a drink whilst hearing the waves from Pissouri Bay. A large dining table and 6 chairs are provided to provide maximum comfort whilst participating in this relaxation. Outside there is a large private landscaped garden, with palm trees and grass, sun chairs and barbecue. The pool is 9m x 4m kidney shape, with a shallow end depth of 1m and the deep end of 1.20m (one level). The pool has its own sun beds, small tables and sun shades. There is also an outside shower. The Master bedroom has a double bed, dressing table, two bedside cabinets, wardrobes. A double patio door leads to the first floor balcony overlooking the pool, garden and sea of Pissouri Bay. The en-suite shower room contains a luxury shower, wash hand basin and W.C. The other first floor bedrooms ( with twin beds), both have substantial built in wardrobes, and bedside cabinets also enjoys a dressing table. Both have patio doors leading onto the balcony. The one balcony overlooking the pool, garden and sea of Pissouri Bay and the other balcony has a mountain view. All bedrooms lead on to the landing off which the main bathroom comprises a bath with shower over hand basin with mirror and W.C. Details of the 3 Bathrooms: One ensuite shower room, One main bathroom , One guest W.C. The island’s second largest city, Lemesos (Limassol) spreads out between two ancient city-kingdoms, Amathous to the east and Kourion to the west, two of the most spectacular archaeological sites in Cyprus. It is the island’s main port, the centre of the wine industry and a bustling holiday resort. A large number of hotels and hotel apartments line a 15 km coastline interspersed with eucalyptus groves and linked by a promenade popular with walkers or joggers.Wander round the narrow streets of the old town radiating out from the fishing harbour. The medieval castle was the site of the royal wedding in the Middle ages between Richard the Lionheart and Berengaria of Navarre, and now houses the Cyprus Medieval Museum, Browse through the array of goods and produce in the atmospheric Market. In antiquity Pafos was the centre of the cult of Aphrodite.Swim in the sea by the rocks known as Petra tou Romiou where the goddess was believed to have risen from the waves, make a pilgrimage to her sanctuary at Kouklia, or visit the grotto near Polis where she was supposed to have bathed.Pafos, with its pleasant harbour and medieval fort, combines a cosmopolitan holiday resort, spectacular countryside and historical sites. It was the capital of Cyprus for 600 years in ancient times and its archaeological legacy is such that UNESCO put the whole town on its World Cultural Heritage List. The intricate floor mosaics in villas dating back to the Roman period depicting scenes from Greek mythology are considered among the finest in the Eastern Mediterranean. Equally impressive are the underground Tombs of the Kings carved out of solid rock and decorated with Doric pillars. 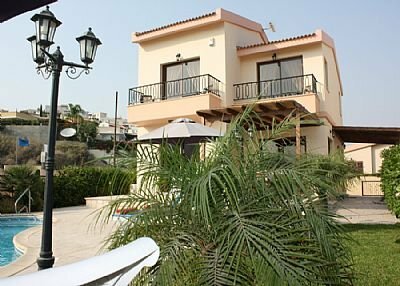 The villa is located 200m from Pissouri Bay, with sea view, private large pool and private landscaped garden.